Update (07/23/11): We performed our tests again and have updated the numbers we observed for low, medium and high temperature operation. We finally decided that even though we had better ways of testing the performance, comparing numbers with other brands wasn't a fair comparison if we didn't use the same methods and calculations. The end result was that some of the numbers got better, some of the numbers got a little worse. This didn't really change our conclusions, however. The pitmasterIQ.com is a great temperature controller and we will keep it in our stable of controllers for our personal use. The barbecue temperature controller market was pioneered and has long been dominated by The BBQ Guru's line of controllers which currently include the NanoQ, the DigiQ, the CyberQ and the ProCom4 controllers. They have been selling controllers since early 2004. They were followed in 2006 by Rock's Barbeque and The Stoker controller which introduced internet connectivity, web-based control and multiple cooker control. In early 2010 another company, Auber Instruments, entered the arena with a low-cost simple temperature controller. In October 2010, yet another company appeared at The Jack in Lynchburg where they introduced yet another temperature controller, selling their first four units. 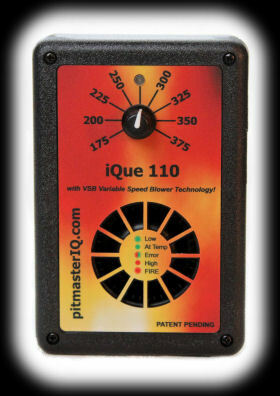 That company was pitmasterIQ.com and the temperature controller they were selling was the iQue 110 temperature controller which is, unless we are mistaken, the first all-in-one barbecue temperature controller to hit the market. The controls, the blower, everything is contained in a single unit. The only thing that isn't part of the unit itself is the temperature probe which goes inside the cooker. As a temperature-control-only unit, it begs comparison with the BBQ Guru NanoQ and the Auber Instruments controller. So let's see how it does! All digital control based on intelligent computer chip! Precise temperature control with a single setting, 175°F to 375°F and anywhere in between. Keeps cooking temperature within 5°F of set point! LED feedback keeps you informed about the temperature inside the smoker! 5 CFM to 15 CFM Variable Speed Blower automatically adjusts air flow to cooker�s air demand! No more trying to figure out what blower size to use! Super accurate platinum RTD temperature sensor good to 0.2% with 54" long temperature cable! Simpler, easier to use, and much lower cost than the BBQ Guru and Stoker! Installs on Big Green Egg, Weber Kettle, Weber Smokey Mountain, and most other pits without tools in under 1 minute! Designed and manufactured in USA by Digital Power & Motion, designers and manufacturer of industrial controls! AC adapter: 110-120VAC. 50-60Hz power supply with 6 foot cord. 12VDC 0.5A output. 5.5mm OD, 2.1mm pin, center positive plug. Optional international AC adapter: 120/240 VAC power supply with several adapters. Operating temperature range: 0°F to 140°F. Operating humidity range: 0% RH to 95% RH, non condensing. Price includes unit, probe, power supply and cooker adapter. The unit is plastic and is not water-resistant. It can be operated in wet conditions using something like the Rain Box project shown on their web site. The adapter for the large or medium Big Green Egg (which we will be testing) is constructed from aluminum. The temperature probe cable should be able to withstand temperatures up to 500°F. It must be kept 12" away from any flame. The iQue 110 clearly falls into the same category as the Auber Instruments controller and the BBQ Guru NanoQ. All three units are intended to be simple, low-cost temperature controllers. None has a food probe or food temperature monitoring as in other more expensive and fuller-featured controllers. No food temperature monitoring means no Ramp Mode or equivalent feature. No wireless, no dual-cooker control, no USB connection. These simpler units control the temperature of your cooker and that's it. If you want internet connection, multiple cooker control, food temperature monitoring and more, you should look at the higher-priced BBQ Guru models (CyberQ II, DigiQ II, ProCom4) or the Stoker from Rock's Barbecue. When you order your system, you specify the type of door adapter you need. The door adapter is included in the price of the system. The components that make up the iQue 110 controller appear to be top notch. The control unit is sturdy and rugged. The cord atop the unit feels strong and subtantial. The control knob is smooth operating. The air hose is heavy and substantial. The temperature probe cable is steel braid and sealed where it enters the probe. The power supply can be gripped firmly to plug and unplug it from a power outlet. Overall, you get the feeling that the unit is quite well built. A couple of notes about the system unit. First, we asked about the blower intake and what would happen if it were obstructed. We found out that this actually �unloads� the blower, causing it to do no �work� (pushing no air). It is a common misconception that this is bad for the blower when in fact it is not. Also we were informed by pitmasterIQ.com that they have no reports of debris being sucked into the blower and causing damage, but it is probably wise to do your best to prevent debris from getting into the blower intake. Q: Is the iQue 110 temperature resistant? A: Yes, when used according to instructions, the iQue will not be damaged. If the iQue is on a pit and the temperature ramps up very high, due to a grease fire or improperly starting the pit, the iQue may be damaged. In this case, the warranty will be void. So it sounds like if you use some common sense about exposing the unit to heat, there should be no problem. And finally a little soap box, if you please. Kudos to pitmasterIQ.com for designing a simple control for a simple controller. We loved using the old BBQ Guru Competitor with its two rotary control knobs. No pressing a button to get to a menu, pressing a button many times to set a temperature. Just twist the knob to the temperature you want and voila! We think the menu systems can be and should be reserved for the more advanced controllers that require them. For a system that only requires one setting, a simple knob is our favorite choice. Flashing green. The cooker temperature is more than 10° below your desired target temperature. Solid green. The cooker temperature is within ±10°F of your desired target temperature. This is the state the controller should be in most of the time after things have stabilized. Solid red. The cooker is more than 10°F and less than 50°F above your desired target temperature. Flashing red. The cooker temperature is more than 50° above your desired target temperature. Next, the control knob. Simply turn it to the desired target temperature for your cooker. It's that easy!